Acquiring a new language. . .it's overwhelming, it's daunting and it just seems so hard. To complicate things more, we want our children to acquire a new language that we may not even speak ourselves. As parents, we all want the best for our children and with so many benefits to acquiring a new language, why wouldn't you want that for you kids? But how? That's where we come in. With Las Lengüitas, your child will understand fluently spoken Spanish from the very first class! Our weekly play-based immersion classes are designed in a way that allows your child to acquire Spanish as naturally as their first language. Small class sizes allow for maximum individual interaction with highly qualified instructors and access to our lending library of books/games/cds/dvds for Spanish learners is included! We even have resources for parents, to help you on your journey of parenting a bilingual child. ​Let's boost brain power! Let's broaden horizons! Let's build tolerance! *Full class descriptions are listed below. How many times have you heard someone say that they aren't good at learning languages? Or that they took 2, 3 or even 4 years of language classes in high school or college and they can't even use it? Have you said these things? It's because all of that class time, or most of it at least, was likely spent learning about the language, not actually acquiring it! When we memorize vocabulary and complete grammar drills, we're learning about the language, not gaining the ability to use it for actual communication. If you want to communicate in a language, you need to practice communicating! At Las Lengüitas, we start communicating in the language from the first moment of the first class by using proven strategies to make the language comprehensible. Interested in what we have for your child? All classes are designed to accommodate beginner through advanced students. Language Babies is designed especially for our youngest learners: babies who are not yet walking. Through developmentally appropriate music and games, we stimulate language learning in your baby while encouraging cognitive development. The Language Babies class will prepare your baby’s brain for future language learning in any language. Parent participation is required. This is the class for my child! Language Discovery is designed especially for toddlers. Through music, games and interactive play that keep them engaged and having fun, your little one will set the foundation for language learning by becoming familiar with the sounds & rhythms of the Spanish language. Parent participation is required. Language Exploration is designed especially for preschoolers who are on the move. A stimulating mix of music and movement games keep your little one busy and learning while we introduce them to more complex ‘big kid’ language! Parent participation is not required. Language Adventure is designed specifically for children who are nearing school age, or in the younger elementary grades and are able to sit and focus for some activities. Music and movement games are blended with storytelling and activities to build confidence and get kids speaking in Spanish in a fun and meaningful way. Parent participation is not required. 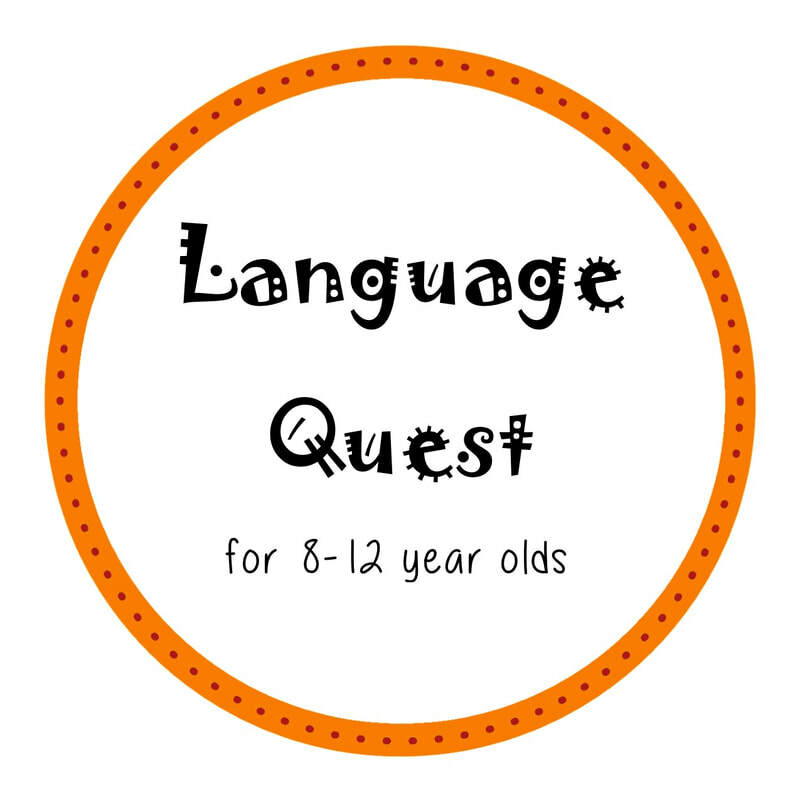 Language Quest is designed to engage middle/upper elementary school kids in Spanish through games, stories and interactive activities. Specific grammar/vocabulary concepts are embedded within the monthly theme and all lessons are aligned with current Standards for Foreign Language Learning. The Language Quest class provides kids with a head start as they go into middle school Spanish class. Parent participation is not required. Worried your child might not be able to keep up with complete immersion? What if the expectations are too high? What if they don't understand what's going on? Don't worry! It's common for children to come into their first class nervous and unsure afterall, how will they understand what to do if it's in Spanish? Most times, these same kids are begging for more by the end of that first class. Our activities are age appropriate, highly engaging and quite often the kids are so engaged that they don't even realize it's all happening in Spanish. THIS is when language is most easily acquired and THIS is our goal for your child. We're trained in both language acquisition and child development. We're experts in making language comprehensible through our expressions, actions, props & environment plus our class sizes are small enough that each child can move at their own pace while getting a lot of individualized attention as we go. While we speak entirely in Spanish throughout the class, students respond in many different ways that are appropriate for their current level including nodding, pointing, repeating, even using English (if a child answers a Spanish question appropriately using English, we know they understood the Spanish question). Regardless of whether or not your child has previous knowledge of Spanish, we have the perfect class to fit your child's needs. Las Lengüitas Private Classes are perfectly customized to meet your family's needs. We design a class specific to the needs and interests of your child(ren) at a time that is convenient for your family & friends. Want to request a private class? All classes include weekly classes & ​access to our lending library of books, cds, dvds & games!